The past few months has been exciting for us here at Beer’d Brewing! We have doubled the floor space of the already existing brewery into an adjacent space. The goal with this expansion was not only to make the tasting room more serviceable, but to also allow for a significantly larger volume in the fermentation cellar. We continue to focus on collaborations with fellow breweries, on Wednesday, December 3rd from 5pm to 8pm we will be hosting our Nano-A-Nano release party! 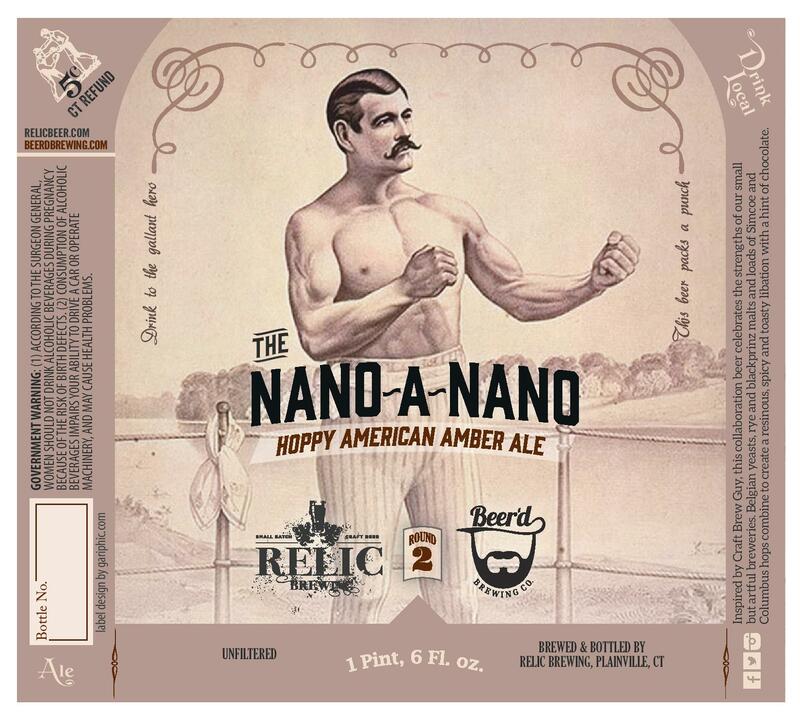 Last year’s Nano-A-Nano collaboration with Relic Brewing of Plainville, was a Belgian Black Rye IPA. This year the duo brewed up a Hoppy American Amber Ale. Don’t miss out on this once a year event! Get your Nano-A-Nano before IT’S gone! 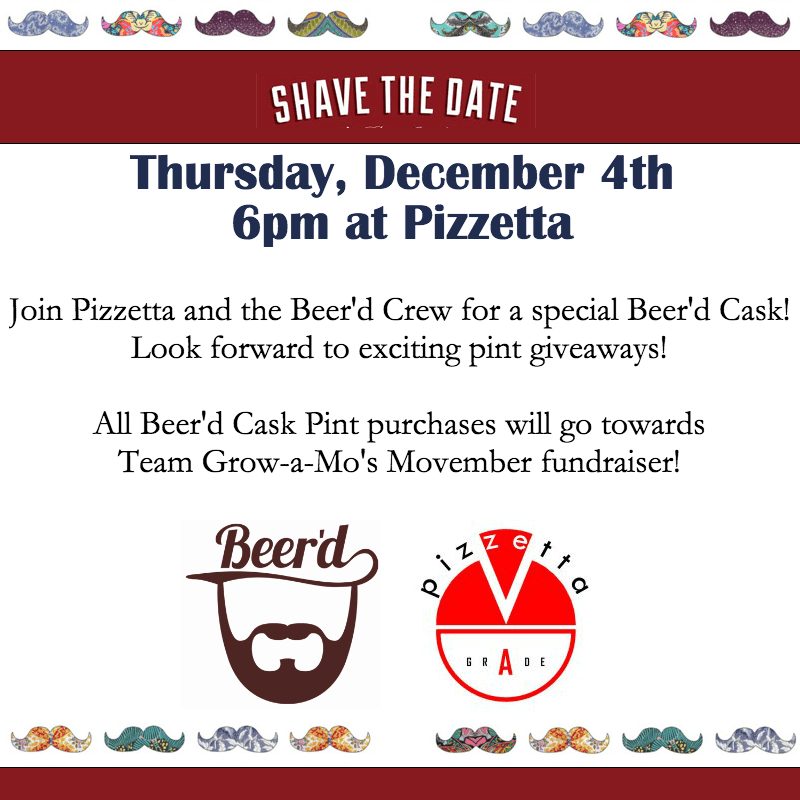 On Thursday, December 4th starting at 6PM, Beer’d Brewing Co. will tap a special cask at Pizzetta. Proceeds from the cask pints will be donated to Team-Grow-A-Mo, which is locally based in Stonington, CT. There will also be giveaways throughout the night. Come early and stay late with us! The Movember Foundation is the leading global organization committed to changing the face of men’s health. Finally, Beer’d Brewing would like to thank everyone for another great year! Last month we celebrated our Two Years of Beer with over 300 guests! We couldn’t be more thankful for our wonderful customers. This summer has been crazy for us here at Beer’d Brewing, and shows no sign of slowing down. A currently ongoing expansion is taking place, doubling the floor space of the already existing brewery into an adjacent space. The goal with this expansion is not only to make the tasting room more serviceable, but to also allow for a significantly larger volume in the fermentation cellar. Currently Beer’d is working with a 3 barrel brew house and 36 barrels worth of serviceable fermentation capacity. With the existing capacity and the planned additions Beer’d should jump into the 70 barrel cellar range. Collaboration has also been a major focus with two new collaborations slated for release between October and November. Already released in August, Beer’d collaborated with Night Shift Brewing of MA on Tropical Hydra, an American IPA featuring a super juicy profile coaxed out through the use of Amarillo, HBC 342, and Wakatu hops. The beer was also conditioned with pineapples and clementine juice. The yet to be named version features a number of ingredients including pineapple and lime juice as well as Citra and Mosaic hops. Also rehashing last year’s Nano-A-Nano collaboration with Relic Brewing of Plainville, the duo will work up a new iteration of a unique Belgian style beer, slated to be released in late November. Finally, Beer’d Brewing will be celebrating Two Years Of Beer with a bash scheduled for mid November. You can expect live music, food trucks and plenty of beer. Tickets will be sold in advance via the tasting room and online. Check the website http://www.beerdbrewing.com and Facebook feed for details as they become available. Beer lovers will want to do themselves a favor and seek out this Connecticut brewery tucked into a former velvet mill in Stonington. It’s so small it’s not even considered a microbrewery—instead it’s a nanobrewery—but the proudly bearded brewer Aaren Simoncini’s carbonated creations have been making big waves in the burgeoning Connecticut craft beer industry. In fact, local bars and restaurants are so eager to carry Beer’d they’ve begun offering to pick up their own kegs. One taste of the Whisker’d Wit will tell you what all the fuss is about—this refreshing witbier is a tasty work of liquid art. Why it’s the best: Beer’d embodies what the microbrewery movement is all about: finely crafted beer made in small batches by a brewing genius. While the explosion of new breweries is making shockwaves in central and southern Connecticut, it’s easy to forget the eastern part of the state. It’s well worth the ride to get tastes of seasoned veteran Cottrell Brewing Co. and brash newcomer Beer’d Brewing Co., which is just what a group of us did last weekend. Aaren Simoncini and Precious Putnam of Beer’d Brewing. The Beer’d Brewing Co. (Stonington, CT) used their Instagram account to announce an upcoming collaboration with Night Shift Brewing (Everett, MA)! This will be the 1st time the two breweries have collaborated a new brew for the public. Vince and Aaren- BEER IS ART!! Beer’d Brewing Co. and Night Shift Brewing Co. may be in two different states, but both companies believe in the craft of beer. Today, Aaren Simoncini from Beer’d Brewing went to Night Shift, located in Everett, Mass., to collaborate on a hoppy IPA loaded with experimental and New Zealand hops. Look for this collaboration brew to hit Night Shift Brewing Co. taps in a few weeks! Don’t worry CT, Vince will visit Beer’d Brewing Co. for another collaboration brew!!! I f you only have one beer road trip in you this summer, aim southwest and head to Beer’d (with stops at Grey Sail and Malted Barley to maximize your time and gas and pleasure). Aaren Simoncini started pouring late in 2012 and quickly made converts with the results of the hop alchemy at his three-barrel brewhouse, which he says “allows us to be creative, agile and extremely hands-on with every ounce of beer we produce.” Aaren is big on imperial/double IPAs; more than a dozen current and past variations are listed on their website. Their tasting/growler filling room is in the American Velvet Mill (think: Hope Artiste Village; Beer’d is open on Friday from 5-9 pm and on Saturday and Sunday from 1-5 pm). Aaren’s partner, Precious Putnam, was the engaging beer guide, proffering two-ounce samples and detailing the particulars of the brews. All five beers were superb, including Whisker’d Wit and Midnight Oil, an oatmeal stout, but we decided on growlers of Hobbit Juice, a phenomenal double IPA single-hopped with the distinctive New Zealand hop, Nelson Sauvin, and 8 Days a Week, a great American Pale Ale made with the uber-tropical Citra hop (and further maximized our time and gas and pleasure with a great lunch — with a great beer selection — at the Engine Room in nearby Mystic). Beer’d is nano-brewing at its finest. Bill Nangle was finishing up his last semester at the University of Rhode Island and decided he wanted to start his own business. A home brewer and a craft beer enthusiast, he decided to start a brewery tour company and buying a bus was his starting point. Now, the Rhode Island Brew Bus is set to run its first all-inclusive brewery tour on Friday. The first tour is called “The Border Jumper” and it starts at Grey Sail Brewing, in Westerly. Then it heads to Cottrell Brewing and Beer’d Brewing in Connecticut before ending at The Malted Barley pub in Westerly.